LES FEMMES - THE TRUTH: Thought for the Day from Fr. Tom: ISIS in the womb! Thought for the Day from Fr. Tom: ISIS in the womb! 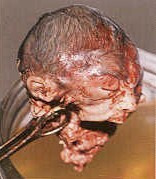 Remember this photo the next time you hear people expressing how much good Planned Parenthood does. Planned Parenthood is ISIS in the womb! And people like Cecile Richards are the equivalent of the Nazi elite zealous to eliminate the "unwanted" and undesirables. What, "Fr. Tom" are you referring to? What a terrifying picture !! Fr. Tom Collins. If you look at the index on the right, you'll see I have a page dedicated to his writing. He's a priest in the Diocese of Richmond, pastor at St. Joseph's in Covington, and a good shepherd. "Donald Trump Hires Pro-Life Advocate as Top Domestic Policy Director"
Pray the Rosary Daily for all Mothers and their children!